Located in the natural marshland region of the Ampurdan, between Empuriabrava urbanization and the estuary of the Grau de Santa Margarida, Platja Rubina is a natural beach with very unique features that make it different from other beaches in the Costa Brava: among them, it allows swimming with dogs (in certain areas) and allows kitesurfing. Furthermore it has excellent services and also beautiful natural dunes. Rubina Beach, in Empuriava, has a length of 1800 meters and offers many services. The beach comes alive especially during the summer. 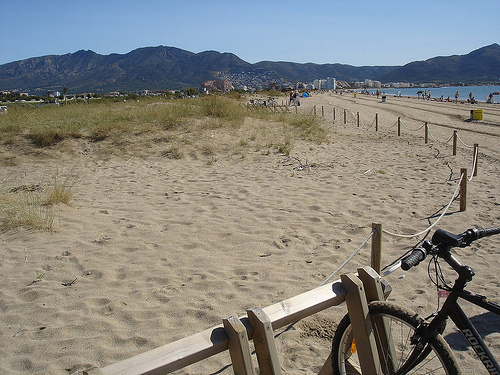 The south end side of the beach coincides with the exit gateway in the Empuriabrava water channels. 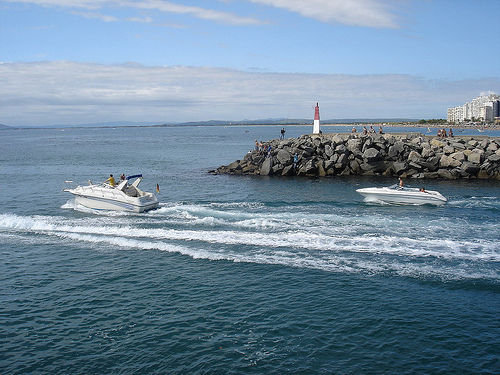 You can walk to the end of this dock and see the departure of many yachts and pleasure boats, almost continuously in summer. 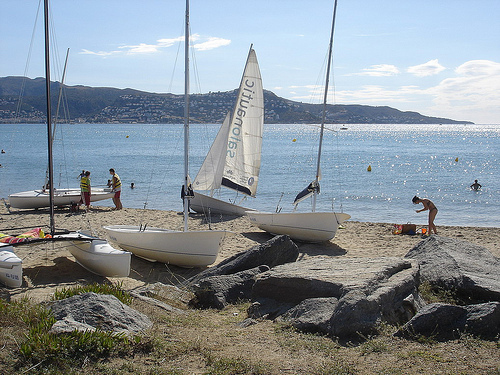 Next to that side of the beach there is also the Empuriabrava Municipal School of Sailing. In this area, young and not so young make their first steps in learning the mastery of sailing boats (children enjoy Optimist ships). We go further to the north and we find more attractions on Platja Rubina. We encounter dunes, protected and properly marked by some wood sticks: they form a small ecosystem integrated into the natural marshland region of l’Empordà. 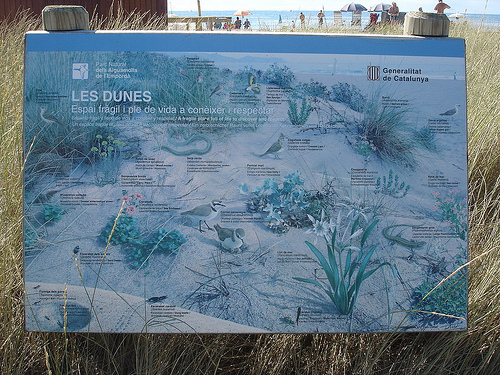 These dunes have a protective effect on the Aiguamolls de l’Empordà Park and surroundings, because they allow the conservation of specific flora and fauna adapted to this environment. Please respect the dunes, entrance is not allowed (not even the dogs!). But that’s not all in Platja Rubina. Finally, a small beach area which is marked allows swimming with dogs and another zone allows kitesurfing, all with the Cape of Creus mountains background in the north direction, clearly visible. You can move along the beach through a well-conditioned flat pedestrian way behind the dunes (they are not so high), so you wan’t have to step over the sand if you just want to walk by the beach. 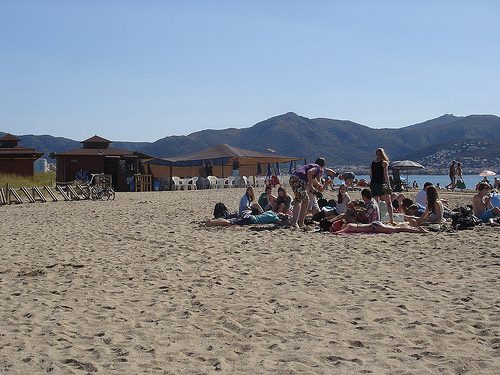 Platja Rubina has all the facilities that a large and important beach offers in Costa Brava, as snack bar (chiringuito), lifeguard services, toilets, showers, sun beds, rescue boat, etc. This beach is wide and familiar with many activities to do, and therefore and excellent place for a great summer day to spend together.